Honorable Prime Minister Shri Narendra Modi accompanied by the Prime Ministers of Sweden and Finland visited the Renault arena at the ongoing “Make in India Week”. Sumit Sawhney, Country CEO and Managing Director of Renault India Operations, shared his perspective on Renault KWID and also presented Mr. Modi with an exclusively designed hand-made scale model of Renault KWID, as a successful testament to the ‘Make in India’ mission. Renault is one of the leading participants at the ‘Make in India’ conclave and is showcasing its clear vison and business strategy of leveraging the design, engineering and manufacturing strength of India, which is led by Renault KWID, Renault’s global car for conquest. Renault KWID is manufactured with over 98% localization and epitomises the ‘Make in India’ ideology. Renault will also soon commence on its export strategy for Renault KWID, putting the expertise of Indian manufacturing on the global map. 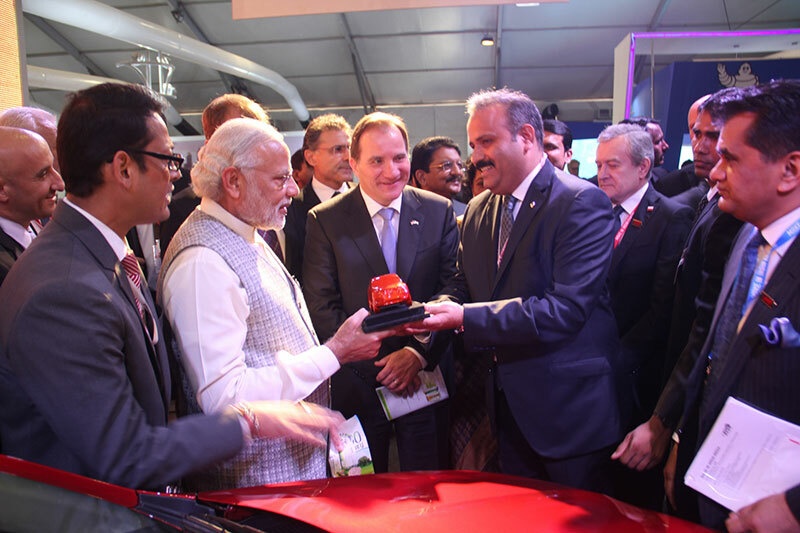 It was a proud moment for Renault in India, as the Honorable Prime Minister Shri Narendra Modi visited the Renault arena to witness ‘Renault KWID’ a successful testament to the Government’s thrust to ‘Make in India’. We shared our strategy and efforts of launching a world-class product by also leveraging Indian talent along with Global. If the country’s economy has to grow, the manufacturing sector has to grow and the automobile industry is one of the major drivers of this sector. We have great confidence that the industry is going to bounce back stronger, and that the ‘Make in India’ campaign will play a key role in growing the economy. Renault has placed emphasis on having a strong local presence and local content with its Chennai production plant, technology, business, engineering and purchasing centres. The design centres in Mumbai and Chennai, logistics centres in Pune and Chennai and its Regional offices in Chennai, Mumbai, Delhi, and Kolkata reflect the brand’s ambition to establish a strong long-term presence in this country. Renault’s commitment to India is also reflected by its extensive network of dealers. This fast-expanding network increased from 14 sales and service facilities in mid-2011 to its current reach of more than 205 sales and service facilities. It will further grow its reach to 240 sales and service facilities this year. In a short span of time, Renault has become the number one European automobile brand in India and will continue to keep the ‘Make in India’ philosophy as a key part of its business expansion strategy.